2. 1/4 th cup (one fourth cup) of aromatic Rice / Polau chaal like Kalijeera, Chini gura or Basmati , soaked ( at least 1 hour)and drained. 1. Pour milk to a heavy bottomed Saucepan or Pot. Add the rice, cardamom pods, cinnamon stick and bay leaf. 2. Cook it on low medium flame , stirring occasionally so that the bottom must not get burnt. 3. The milk will come to boil but keep cooking. When the milk has come to almost the desired consistency add sugar. You may add 3 tbl spoon of powder milk, dissolved in half cup liquid milk or you may add 1/4 th ( one fourth cup )cup of evaporated milk at this point for extra creamy texture. Cook a little while. Add raisins and chopped nuts. 4. The firni or payesh gets thicker after cooling down. So don’t make it too thick. Sprinkle some rose water if you want. 5. Garnish with almond, pista and raisins. 1. The milk alwayz rise up to the top of the pot. So to be care free alwayz use a large pot to prevent overflowing and mess. 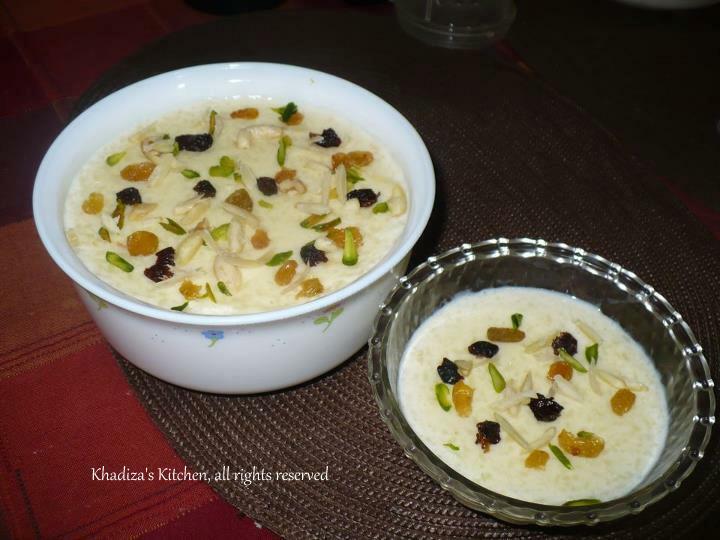 This entry was posted in Desserts, Glossary / Notes and tagged Bangladeshi dessert, dessert, finni, Firni, Indian Dessert, kheer, Khir, leche de con, milk pudding, payasa, payasam, Payesh, rice pudding, South Asian dessert, South aSIAN fOOD. Bookmark the permalink. Thanks… we can know many recipe from here….. I have learnt many thing form here…….